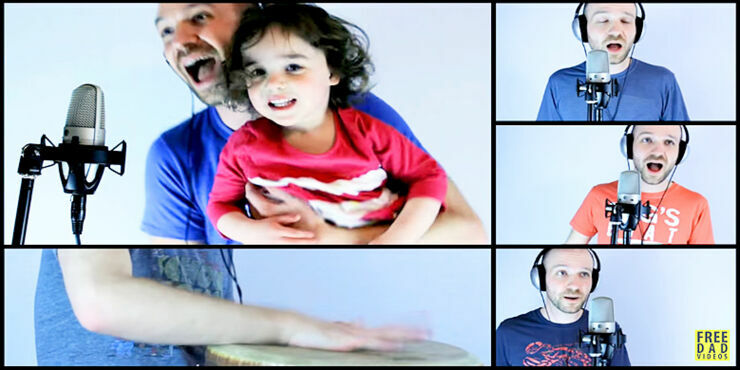 Norwegian pop group Aha's eighties classic Take on Me gets an adorable cover version thanks to the winning combo of father daughter team, Matt Silverman and 3-year-old Amelia. The duo, from New York, use an array of instruments for their take on Take on Me cover, including acoustic guitars, maracas, bongos, and some xylophone playing. And their own voices of course, which includes Amelia showcasing her singing talents. The pair may also look familiar to you, and that won't be surprising because they're old hats at creating viral-worthy videos. Like when Matt turned Amelia into an X-wing pilot for her very own Death Star trench run scene. Plus, along with Take on Me they've also released plenty of other covers too, like Walk The Moon's song Shut Up and Dance and Gangsta's Paradis by Coolio. The former was the video that launched Matt's YouTube channel (and YouTube career) FREE DAD VIDEOS where he posts the pairs' adorable creative endeavours. But back to their latest offering, it all adds up to a very impressive version of A-ha's Take on Me that is seriously, toe-tappingly catchy. And it's presented with a montage of scenes of the pair jamming away on their various instruments. Matt's guitar playing and singing are undeniably impressive, but the real star must surely be Amelia, who is just too cute as claps, sings, dances, and generally charms. Have a listen to their charming Take on Me cover in the video above and check out the pairs' covers of Walk The Moon's Shut Up and Dance and Gangsta's Paradis by Coolio, below. And Matt's YouTube channel for more.